The Steve Fairnie story began on the 21st February 1951 in Fraserburgh, a small fishing village in Aberdeenshire, Scotland. Fact-fans will be pleased to note that the Beatles once performed there, at the tiny Dalrymple Hall in May 1960 as the Silver Beetles, backing Johnny Gentle. Stephen Angus was the youngest of three children to be born to Robert Fairnie and his wife Mary née King. In his youth, Robert had been a North Sea fisherman but went on to be a ‘fisher of men’, starting Evangelical fellowships in Fraserburgh and in Musselburgh just outside Edinburgh. Many Fairnies hailed in fact from Musselburgh and most had indeed been involved in the fishing industry. It is reported that at one time there were 29 Fairnies in the Edinburgh area telephone directory! 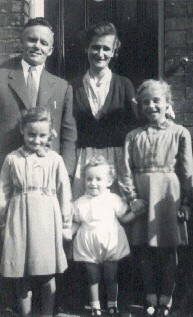 The family’s early claim to fame was that Robert’s cousin Margaret married the Hibernians football legend Willie Ormond (one of the ‘Famous Five’), who went on to manage St Johnstone, and the Scotland squad who were the only unbeaten team at the 1974 World Cup finals held in what was then West Germany. Willie Ormond resigned from the Scotland job in 1977 before short spells managing Hearts and Hibs. He retired from the game in 1980 and ran a pub in Musselburgh until his death in 1984. To this day he is still regarded by many as Scotland’s greatest ever manager. Fairnie treasured his signed photos of Willie Ormond and would remain a loyal follower of Hibs’ fortunes. As early as February 1952, Fairnie Senior’s pastoral duties took him and the family to Norwich in East Anglia, before moving back to Fraserburgh from 1957 to May 1964, and then on to the Mount of Olives church in Bristol, based at the time on Blackboy Hill. The Fairnies set up shop in the manse, a mere stone’s throw from the Downs, each family member fitting in to the scheme of things in the West Country – sisters Ruth and Rhoda marrying local boys and Steve attending Monks Park Comprehensive, excelling in Art. It was at the ‘Mount’ that Fairnie met another Steve, Steve Rowles, the duo forming the cornerstone of some light-hearted musical projects that would eventually result in Fish Co .
With the music taking shape in the background, Fairnie headed off to study art in Stoke-on-Trent, and then later to the prestigious Royal College of Art in London, emerging with a Masters degree in Sculpture after some seven years of studies. Along the road, he bumped into young photographer Bev Sage, and the two were soon to become inseparable. Steve and Bev finally tied the knot on Saturday 31st December 1977 in Bev’s home-town Torquay. Rather than shout from the rooftops, the truth behind Steve and Bev’s marital status was kept for those in the know. Bev retained her maiden name on subsequent projects, and the are-they-aren’t-they ambiguity of the Fairnie/Sage relationship added an extra dimension of mystery and intrigue to the couple’s career. Since the wedding was in all likelihood the last one to be held in the year of the Queen’s Silver Jubilee, and although the ceremony and reception were strictly close friends and family affairs, HRH Liz II was sent an invitation. A kind reply was received from a Lady-in-Waiting, politely declining the request to attend. The couple took up residence in a small flat in London, and set about conquering the world as we know it. In August 1984, their legacy moved into whole new realms with the arrival of daughter Famie, and in December 1986 with the birth of son Jake. In the meantime, the new family unit had got out of the hustle and bustle of the London lifestyle, and moved back to the more humane delights of Bristol, initially to a fine Georgian house in Henleaze, and then on to a magnificent ground-floor flat on Royal York Crescent in fashionable Clifton, which would become not only a place to live, but the ideal setting for work… as well as providing some much-needed space to store Fairnie’s extensive collection of tin toys. In Clifton, Steve lapped up his reputation as mad artist turned model father, even appearing on the cover of a local newspaper, photographed in a supermarket pushing the kids around in a shopping trolley. Over the years, Fairnie the family man also found the time and energy to put on an annual conjuring show at Christmas parties for nieces and nephews, who often struggled, come adulthood, to shake off the habit of referring to him as ‘Uncle Teddy’ (n. fam. origin unknown but perhaps due to impressive facial hair in early seventies, or occasional wearing of massive Rupert Bear head). He was an accomplished conjuror and would never cease to amaze his invitation-only audiences, the tricks being dressed up as ever in a cloak of theatricality and humour. Fairnie passed away on the 22nd February 1993 in Brixham, Devon. He was on a field trip with a group of students from Weston-super-Mare College, where he was a lecturer. The funeral took place on the 2nd March at Christchurch, Clifton. Bev now divides her time between London, Bristol and various locations around the world (in the name of “global research” with her partner, former NME editor Alan Smith). Famie is a gifted artist, currently studying in London. Jake has just completed his PhD in Cognitive Neuroscience at University College London and is also making a name for himself as a songwriter and musician – his drumming skills have already caused various members of U2 to sit up and take notice. As for Steve’s parents, Robert Fairnie passed away a few weeks short of the year 2000, his loyal wife Mary in June 2001.